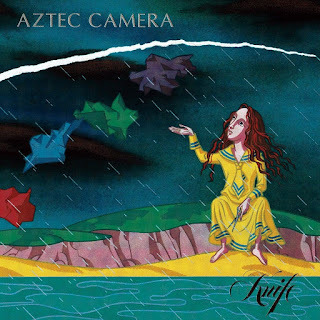 Roundly trashed upon its fall 1984 release -- many reviewers took the album almost as a personal insult -- Knife is nowhere near as terrible an album as it seemed at the time. One must remember the circumstances, however: 1983's High Land Hard Rain, as well as the preceding singles on the legendary Postcard and Les Disques du Crepuscule labels, had presented Roddy Frame and crew as the jazz and folk-inflected, acoustic guitar-slinging saviors of pop music from the synth-driven hordes. Knife, on the other hand, was (yikes!) produced by Dire Straits' Mark Knopfler, who (gasp!) brought in a pair of keyboard players to color Frame's (shriek!) newly R&B-flavored pop songs. In retrospect, though, Knife is, while deeply flawed, a thoughtful and largely likable set of tunes. There are three killer singles, the danceable "Still on Fire," "Just Like the USA" (which features a jiggly guitar riff that almost turns into the hook from the Jackson 5's "I Want You Back" in a few spots), and the sublime "All I Need Is Everything," a lovely, yearning tune based on a hypnotic guitar riff and featuring possibly the best chorus of Frame's career. Slightly below that fine triumvirate are "The Birth of the True" and the stirring "Backwards and Forwards," which both recall the pretty but slightly strident ballads of Frame's early career, and the peppier "Head Is Happy (Heart's Insane)," all of which are perfectly respectable tunes. Then, though, comes the bland, forgettable "The Back Door to Heaven," and the truly horrible title track, which stretches out too few musical or lyrical ideas over an endless, nearly ten-minute track that seems to be going for a Dire Straits-like ambience but merely sounds noodly and insipid. With a more sympathetic producer and a less obvious method of filler (why not record new versions of those early singles? ), Knife would have made it past the cultural arbiters. As it was, Aztec Camera never really recovered.